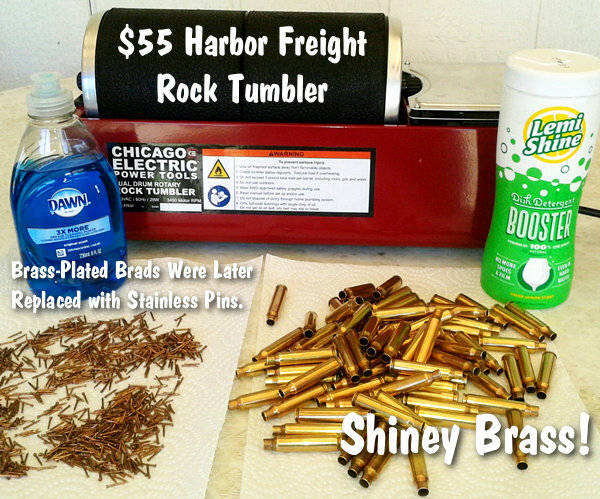 In our Shooters’ Forum, Forum Gold Member Terry asked: “How do you dry your brass after Ultrasonic cleaning?” In an interesting Reloading Forum Thread, many smart suggestions were posted. A dozen fellow members outlined a variety of effective case-drying procedures, which work equally well for both wet-tumbled brass and ultrasonically-cleaned cases. Here are the Top 10 brass-drying suggestions from our Forum members. 2. 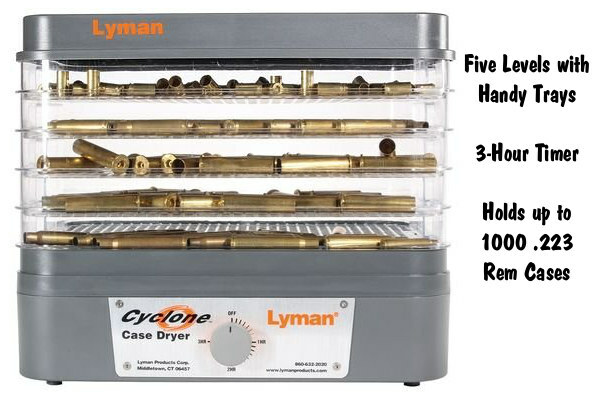 Lyman 5-Level Case Dryer — Rinse off cleaning solution(s), then load brass by type into racks in Lyman Cyclone Case Dryer. This is easier to load/unload than food dehydrators and holds more cases. NOTE: Many other members suggested oven drying at 150-200°. We recommend turning OFF the oven so you don’t cook your brass if you forget to remove the cases. Deprime, then tumble brass with stainless media, water, Lemishine, and dish detergent. Shake them easily in a strainer to knock out most media then grab 4-5 pieces, shake them over the bucket for the last of the media then inside a towel. Finally blow out the primer pockets and wipe with a towel, load in the Annealeez. 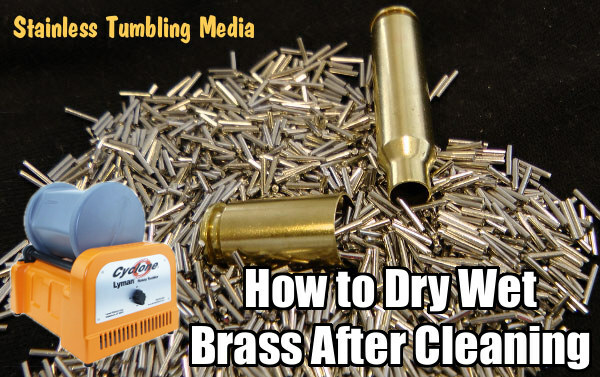 Share the post "TECH Tip: TOP TEN Ways to Dry Wet Cartridge Brass"
Be very careful with the oven drying method and make sure to use a thermometer. Overheating your brass can soften your case heads which can then expand inside the bolt face and be a REAL bear to extricate. Ask me how I know. How about an article on the damage that these cleaning techniques do to the brass? Or dirty versus clean accuracy? Editor: You raise some important points. For restoring old range brass, ultrasonic cleaning can work wonders. But I have 8+ reloads on my centerfire match rifle brass and it simply gets a wipe with Ballistol after shooting to remove the carbon on the outside of the neck. No tumbling, no ultrasonic. And we believe that a little carbon inside the neck can be a GOOD thing. However, for PRS guys and other folks whose brass gets on the ground, or for those who want to get all the gunk off the inside, brass cleaning may make sense. I dry my brass via a 5 gallon bucket of alcohol, dunk a basket of 500 pieces of brass in the bucket, the alcohol bonds with the water and then when removed the alcohol evaporates. Then test for water dilution of the alcohol to see when it needs distilled back to pure alcohol. Simple, easy, and clean, and requires minimal energy. After ultrasounding my brass all I do is drain it and then dump the moist cases into a tumbler. The tumbler medium absorbs the moisture and after twenty to thirty minutes the brass is perfect. Don’t need to dry separately. Works perfectly. Has anyone tried replacing the water in the wet-pin tumbling process with alcohol, denatured or otherwise? Probably won’t need the detergent, either, the pins just knock the tarnish / dirt off the cases. Definitely some fire risk; pure alcohol fumes, any heat or spark source….. Maybe best tried outdoors, away from the house and garage. Strain and shake off the excess alcohol. Spread the brass on a clean cotton sheet or old beach towel laid on a concrete pad or such. Will work better with direct sunlight in Summer. Once my cases have been final-rinsed (I collect & save water from my basement dehumidifier for this) I put ‘em in saved 50-case plastic ammo holders, knock the water out of most of ‘em by rapping holder against my palm, then put the cases neck-up on a wire closet rack beside that dehumidifier’s outlet grille. Cases dry overnight this way. Otherwise it’s an afternoon on the porch or driveway in the sun from May-October. If’n I need ‘em quicker I put a bunch in a metal sieve (also useful for catching them when they drop out of my MRB annealer) then heat ‘em up with an industrial heat gun. Takes maybe 15-20 minutes to do start to cool-enough-to-handle finish.